Israeli soldiers abducted, on Monday at dawn, thirteen Palestinians from their homes, in several parts of the occupied West Bank. Media sources in Ramallah, in central West Bank, said the soldiers invaded several towns in the governorate, and violently searched many homes, causing damage. They added that the soldiers abducted Othman Zeid and Abdul-Salam ‘Aabed, and took them to an unknown destination. 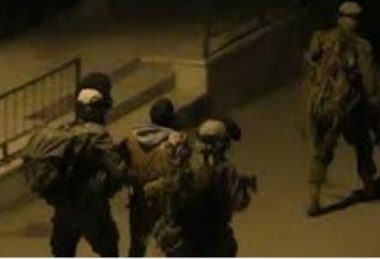 In Tulkarem, in northern West Bank, the soldiers abducted four former political prisoners, identified as Raed Mohammad Qozah, 48, and Hani Suwwan, Bakr Mohammad Kharyoush, 27, and Mohammad Suleiman, in addition to Jamal Hadayda, 50. In Qalqilia, also in northern West Bank, the soldiers abducted Ahmad Zahran Salim, 19. In Bethlehem, the soldiers invaded and searched homes in the al-Khader town, south of the city, and abducted Daoud Salah, in addition to three former political prisoners, identified as Mohammad Salah, Tha’er Salah, Osama Salah and Ahmad Ghneim. It is worth mentioning that the soldiers abducted, on Sunday evening, Fateh Movement secretary, in Shu’fat refugee camp, in occupied Jerusalem, Mahmoud Sheikh, after stopping him at Hizma military roadblock, north of the city.